← Sushi Brunch with space to play at Ura Japanese Delicacy! Do you have a special someone? Someone to share a luxurious pampering experience with, just the two of you together? Someone that you know would love a relaxing day à deux, unwinding in the lap of luxury while all the stresses of daily life fade away? Well, due to Mr T-T’s irrational and, some might say unnatural hatred of massage (I have never seen a man look more unhappy than on the day I took him for reflexology at the now-defunct Causeway Bay branch of Tai Pan), combined with his uncontrollably fidgety behaviour, I’ve had to look a little further afield to find my one true spa-tner. Happily not too far though – my Editors’ Ink co-founder and fellow lounge-loving beauty blogger Rach has turned out to be my perfect pamper-partner. 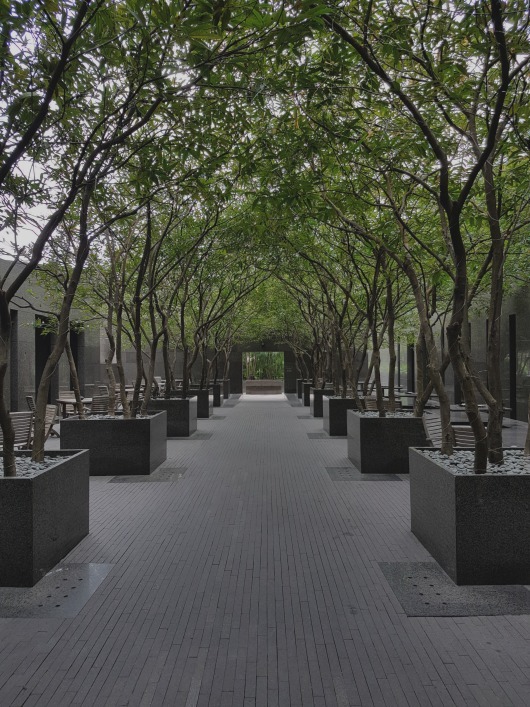 And so when the friendly folks at the Grand Hyatt Hong Kong invited me to test-drive a romantic couple’s package at Plateau Spa, I only had to flutter my eyelashes in her direction for the date to be set. 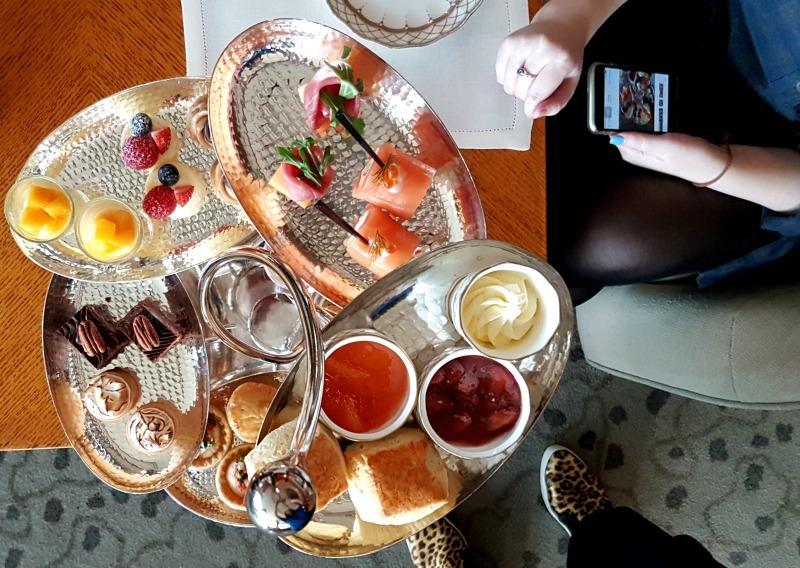 I’ve visited Plateau a couple of times before (this review of the Seasonal Spice package was one of last winter’s major highlights), and have always loved the spacious blonde wood suites and stunning harbour views from this serene lookout on the 11th floor. And serene is the word – I don’t know whether it’s just smart hotel design or if Hyatt have invested some serious money into superior sound-proofing, but despite being informed that there would be some work taking place in the spa reception on the day of our treatment (and being offered the opportunity to reschedule), our suite remained pin-drop quiet throughout the treatment. 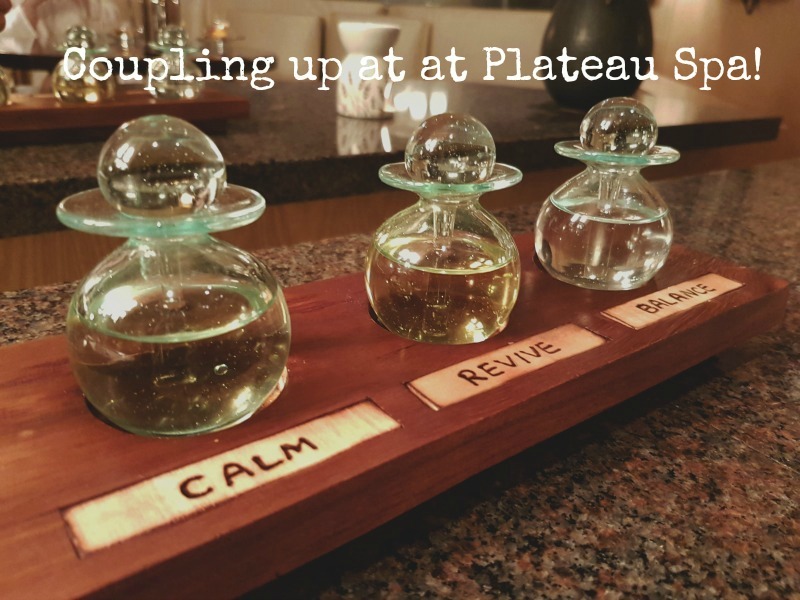 Speaking of which, Plateau’s seasonal treatments are always well thought-out, and this one was no exception. 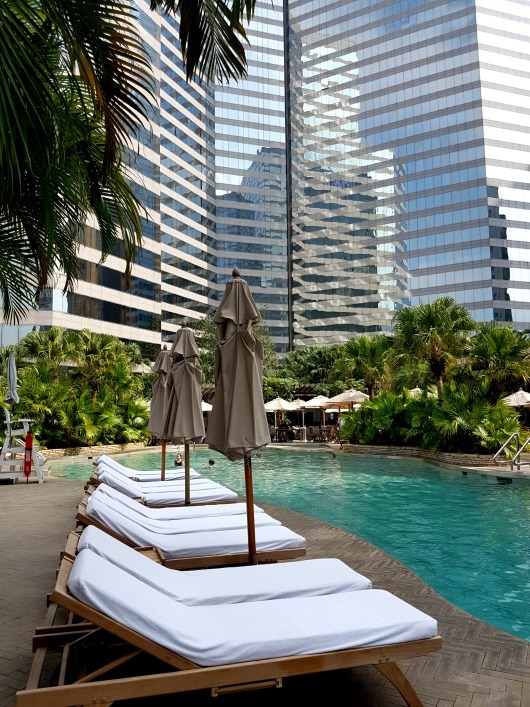 The Rose Indulgence couple’s package consists of a 60-minute hydrating and toning rose massage for two and use of the pool and heat facilities, followed by afternoon tea served in the Grand Hyatt’s lounge, Tiffin. 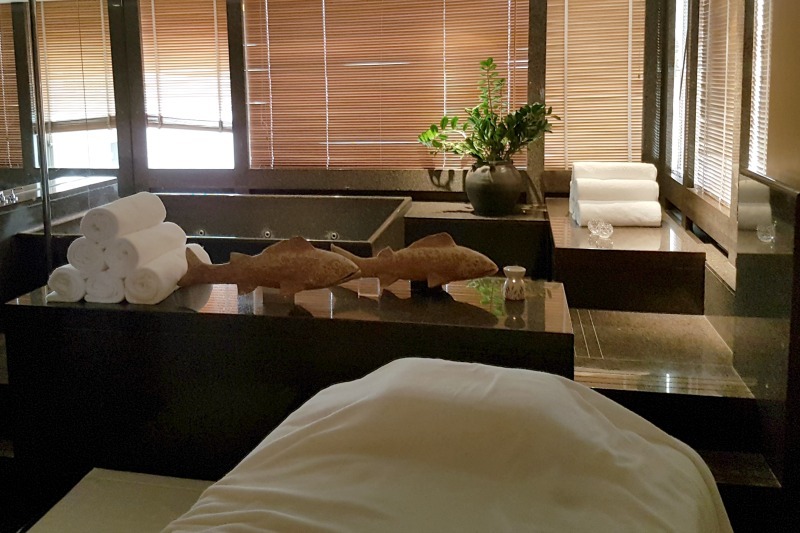 We decided to time our visit so that we could enjoy the massage first then spend some time relaxing before tea at 3.30pm, however treatments can be booked according to your preference so you can tailor your relaxation according to your schedule. Arriving at the hotel around midday, Rach and I were served rose petal tea in the reception area, before being escorted to the Deluxe Treatment Suite (the spa’s largest room) to fill in a brief questionnaire about our expectations for the treatment. (As usual, when asked to mark on the diagram any particular areas of the body that were particularly tight and uncomfortable, I just scrawled a large circle around the entire picture and ticked “all of the above”, something that my therapist took in her stride). The suite was absolutely vast, with a combined changing area and lounge (complete with sofa and TV) on one side, and an enormous twin treatment room with rain shower, steam room and whirlpool spa bath on the other, and can actually be connected to an adjoining guest room for an incredibly lavish sleepover (MAJOR #lifegoals). One we had changed into our signature super-soft chenille robes (these things are incredible – I can only assume that they skin teddy bears to make them or something), our treatment began with a foot soak in scented water, and then we moved through to the massage beds for the main event. The addition of heat pads to my bed was extremely welcome on a cool January day, and almost as soon as the first drops of rose oil hit my skin, I began to zone out. As requested, my therapist applied firm pressure to work out my knots, using a combination of targeted kneading with longer strokes to really loosen and lengthen the muscles – this occasionally made me jump a little as she found a particularly tender spot, but the pressure was exactly what I’d requested, and this was one of the most effective massages that I’ve had in a long time. Reluctantly peeling ourselves from the massage beds, we floated back to the lounge area for post massage rose petal tea and fruit, before reluctantly vacating the suite for stage two of the afternoon – pool time. Now, you’s be forgiven for thinking that hitting the – albeit spectacular – outdoor pool in January is nothing short of madness, but regular readers will know that there isn’t a hint of bravery in me, and so this was no heroically icy plunge, rather a balmy heated bob-about in (mercifully) heated water. In warmer weather, this would be the perfect opportunity to grab a lounger for an afternoon of dozing and drinking, however, although Rach and I managed well over an hour of putting the world to rights in the water, it was a little too chilly to linger poolside, and so we retired to the changing room for hot showers, just in time for tea. Unusually for a hotel lobby lounge, Tiffin is actually up on the first floor, so don’t forget to channel your inner Ginger Rogers as you sweep back down the curved marble staircase on your way out again. 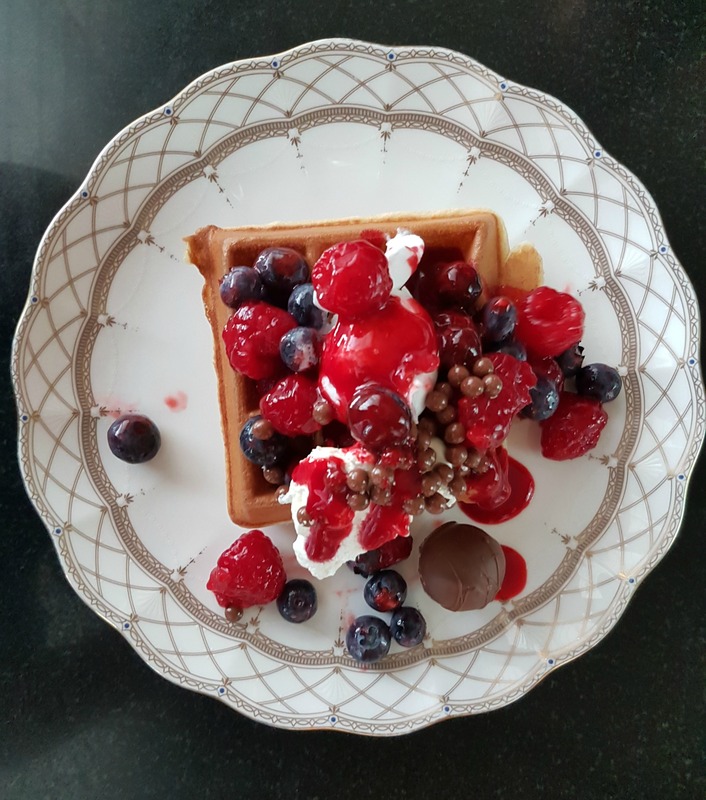 Afternoon tea is served from 3.30pm every day, and includes a selection of savouries, sweets, scones, tea and, in case that wasn’t enough carb-loading for you, the exciting addition of an ice cream and waffle buffet. Obviously I considered it my journalistic duty to thoroughly sample everything (except the foie gras, which I continue to diligently avoid, despite its inclusion on nearly every Hong Kong menu). The tea was good, although personally I would have preferred a couple more savouries to balance things out a bit (it’s possible that this is just because I didn’t eat the foie), and I enjoyed going to town on my waffle, loading it up with fruit, cream and chocolate sprinkles into the sort of gooey indulgent pile that I’d refuse to let my kids eat. Isn’t it great to be a grown-up? We finally left at around 5.30pm, nearly 5.5 hours after our arrival, making this an indulgence that you can either stretch out into half a day of relaxation, or else schedule around a busy day. So, assuming your significant other is more open to the idea of a couple’s spa day than mine is, book this in for a Valentine’s Day gift. Alternatively, grab a trusty platonic spa-tner and enjoy your day, no strings attached. The Rose Indulgence package includes a 60-minute couple’s massage, use of the pool and heat facilities and an afternoon tea for two served at Tiffin. Package costs $2,200 (+10%) for two and is available from now until 31st March 2017. Please note that our visit was by invitation – thank you for having us!